This study aims to produce activated carbon from low-rank coal from East Kalimantan, Indonesia by a mechano-chemical method and to determine its adsorption parameters: hydrogen uptake/capacity, activation energy, the structural heterogeneity parameter, and the isosteric heat of adsorption. The hydrogen uptake/capacity of the coal was determined by a volumetric adsorption test using constant-volume-variable-pressure (CVVP). The characteristic adsorption parameters, such as hydrogen uptake, characteristic energy and heterogeneity structure factor, were determined using the coupled Langmuir and Dubinin-Astakhov (D-A) isotherm models, with the assumption that the hydrogen uptake value would be similar, irrespective of the model used. We found that the mechano-chemical method significantly reduced the particle size of the activated carbon relative to the untreated control, by approximately 60%. In addition, the activation process yielded a higher surface area for the activated carbon (390 m2/g) compared to the untreated control (90 m2/g). We also found that greater surface area led to a greater uptake of hydrogen by the activated carbon (40.17±1.56)×10-3 kg/kg than by the untreated control (7.94±1.56)×10-3 kg/kg. We also found that the heterogeneity factor of the activated carbon was 3.73±0.23, lower than the untreated control 4.65±0.56, which reflects the more heterogeneous pore diameter sizes for the activated carbon compared to the untreated control. Lastly, using the obtained adsorption parameters, we observed that the hydrogen uptake-dependent isosteric heat of adsorption on the activated carbon changed rapidly in the initial and final stages compared to the untreated control due to the adsorption of hydrogen by smaller pores which reside inside larger ones. Hydrogen is an ideal future fuel source. For example, it can be utilized in combustion to produce water, which does not contribute to air pollution (Serrano et al., 2009; Jiménez et al., 2010; Nasruddin et al., 2016). In fuel cell applications, hydrogen is directly converted into water, electricity and heat. Therefore, the use of hydrogen as an energy source may possibly reduce harmful emissions of greenhouse gases (such as carbon dioxide, carbon monoxide, hydrocarbons, nitrogen oxides, and sulphur oxides), and may reduce global dependence on fossil fuels, especially in the transportation sector. For hydrogen to be properly used as an energy source, an effective storage medium is needed. The required properties of a hydrogen storage medium are that it should be low in weight, low in price, easy to activate and have good availability, high volumetric and gravimetric hydrogen density, and long-term cycle stability (Niemann et al., 2008). Some examples of hydrogen storage materials are carbon-based ones such as activated carbon (Marsh et al., 1984) and graphite nanofiber (Chambers et al., 1998), and other materials such as metal organic frameworks (Li et al., 1999), zeolites (Dong et al., 2007), clathrate hydrates (Lee et al., 2005) and metal hydride (Schlapbach & Züttel, 2001). Activated carbon is an appropriate choice for a hydrogen storage medium due to its high porosity (Nor et al., 2016), low bulk density (Caturla et al., 1991), reasonable cost (El Qada et al., 2006), relative abundance, and capability to store gases on its surface (De la Casa-Lillo et al., 2002). It can be produced from carbon-rich materials such as coal and various agricultural residues (Ioannidou & Zabaniotou, 2007). Among these, coal has the greatest potential as a carbon-containing material because it is relatively abundant and economical. Further, the production of activated carbon from coal can increase its commercial value. Basically, activated carbon can be produced by two methods: by chemical activation (Marsh et al., 1984; Kumamoto et al., 1994; Ahmadpour & Do, 1997; Tsai et al., 1998) or by physical activation (Caturla et al., 1991; Ahmadpour & Do, 1996; Bouchelta et al., 2008; Nandi et al., 2012; Sekirifa et al., 2013). In this study, we develop a combination of physical/mechanical and chemical methods, known as the mechano-chemical method, to produce activated carbon by means of a planetary ball mill and with KOH introduced. Mechanically-driven activation is induced by imposing a mechanical force on a material, and chemical activation is induced by reacting a chemical compound with the material. We expect that the combination will produce activated carbon which has good characteristic adsorption parameters. Several models have been developed to characterize gas adsorption in microporous materials (Do, 1998). Among them, the Dubinin-Astakhov (D-A) model is well known for its characterization of the non-homogeneous structure of microporous materials. In this model, some parameters can be revealed to evaluate the gas adsorption characteristics of microporous materials, such as carbon-based ones. Several previous studies have examined the D-A model to characterize the adsorption behaviour of multiple gas species on activated carbon materials (Hu & Ruckenstein, 2006; Ushiki et al., 2013; Wu et al., 2014) and have determined that it is applicable for such a purpose. This study aims to produce activated carbon from Indonesian low-rank coal by a mechano-chemical method and to determine its adsorption parameters: hydrogen uptake/capacity, activation energy, the structural heterogeneity parameter, and the isosteric heat of adsorption. The volumetric method-based experiment was designed to determine the adsorption parameters, and two simultaneous isotherm methods—the Langmuir and D-A methods—were coupled to calculate the adsorption parameters properly. Further, the parameters obtained from the calculation can be used to predict the mechanism of hydrogen adsorption on the activated carbon surface. 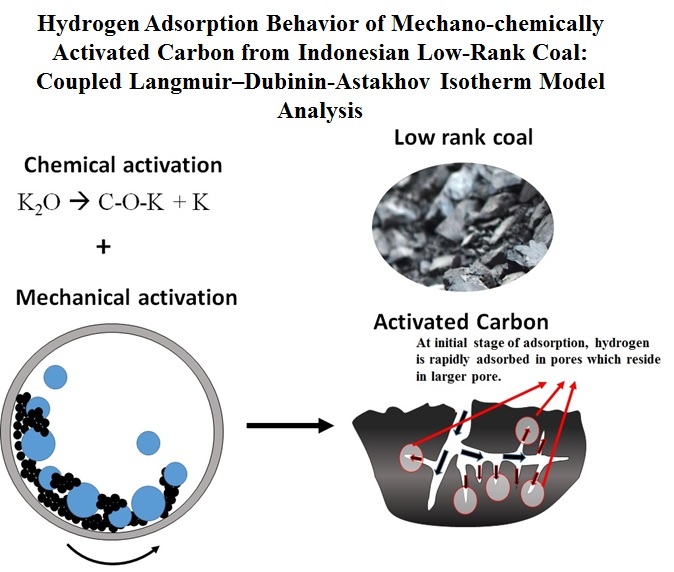 Activated carbon has been produced from untreated Indonesian low-rank coal using a ball mill mechano-chemical method and its adsorption parameters have been successfully calculated using a coupled Langmuir and D-A isotherm model. It was found that the activated carbon has a higher pore volume and larger surface area than the low-rank coal. This leads to a higher hydrogen uptake or saturated amount of adsorbed hydrogen in the activated carbon compared to the untreated coal. The saturated hydrogen adsorption capacity of activated carbon led to an increase of about 500%, from 0.8% to 4.02%. From the calculation using the coupled Langmuir and D-A models, it is observed that the heterogeneity of energy distribution (which is related to the width of pore size distribution) of the activated carbon structure slightly increases, as shown by the n parameter, which is lower than that of untreated coal. It was found that the isosteric heat of adsorption increases rapidly at the initial and final stages of adsorption due to the adsorption of hydrogen on smaller micropores which reside inside larger ones. The publication of this article is supported by the United States Agency for International Development (USAID) through the Sustainable Higher Education Research Alliance (SHERA) Program for the Universitas Indonesia Scientific Modeling, Application, Research and Training for City-centered Innovation and Technology (SMART CITY) Project, Grant #AID-497-A-1600004, Sub Grant #IIE-00000078-UI-1. Comprehensive discussions with and comments from Dr.-Ing. Nasruddin of the Department of Mechanical Engineering, Universitas Indonesia, are very much appreciated.